NYU Just Dropped Its Contract With JanSport—Why Is That a Victory for Global Labor Rights? New York University’s Student Labor Action Movement got the the administration to finally act responsibility when doing business with the global fashion industry. JanSport might be a high-profile brand on college campuses, but some savvy student activists are exposing the corporate dirt beneath the label. After months of protests, New York University’s Student Labor Action Movement got the the administration to finally act responsibility when doing business with the global fashion industry. The group has persuaded the University to cut its merchandise licensing deal with JanSport “until and unless” the manufacturer signs onto the Bangladesh Accord on Fire and Building Safety. The university was responding to calls by SLAM, similar to those made on many campuses nationwide, to incorporate the Accord into its licensing deals for merchandise makers. The Accord is a landmark independent agreement that imposes binding rules and standards for building safety on the country’s massive and poorly regulated garment shops, aimed at preventing massive disasters like the Rana Plaza factory collapse, which left more than 1,100 people dead a year ago. NYU has decided not to place any new orders of merchandise produced by JanSport until and unless JanSport and its parent company, VF Corporation, agree to sign the Accord on Fire and Building Safety in Bangladesh…. If the University determines that it is unlikely that either JanSport or VF Corporation will sign the Accord by the end of the summer, NYU is prepared to cancel its licenses with JanSport by the start of the fall semester. In a way, it’s a sideways targeting of VF: the parent company has interests in Bangladesh, and the NYU JanSport products would not have been directly sourced from the country’s factories (which NYU was keen to note in its public relations on the issue). However, the action taken against a VF brand extends the scope of institutional responsibility, since targeting the company via JanSport solidifies the accountability link across the supply chain in university procurement. As the central corporation, VF is held both (1) responsible for labor and safety conditions throughout the production chain, and (2) horizontally accountable to college clients and consumers that use affiliated brands. And as part of a national effort coordinated with United Students Against Sweatshops (USAS), the students, for their part, made a mark by showing how far their collective pressure could go, both overseas and in the university hierarchy. The JanSport victory caps a months-long pressure campaign to persuade the administration to incorporate the Bangladesh accord in its Labor Code of Conduct for licensees; VF remained an outlier by refusing to sign on. But NYU student Iraj Eshghi noted that it took a while to grab the administration’s attention, because “they essentially did their best to ignore us. We spent most of the semester trying to get meetings with the administration. We sent them letters, we sent them emails, they responded saying that JanSport doesn’t produce in Bangladesh.” They kept up the pressure on the main target, the parent company VF, and after they staged a sit-in, the administrators finally sat down with the protesters. Then, recalls Eshghi, they discovered the students were the last to be consulted after discussions within the administration and with outside labor activists. VF’s empire includes labels like Northface, Timberlake and Vans, and according to USAS, is “the largest branded apparel manufacturer in the world.” The fallout of the Rana Plaza disaster put it under global scrutiny, and is now one of the major holdouts in the industry, along with Walmart and GAP, who have balked at signing the Accord. Instead, these manufacturers have tried to advance a weaker factory safety agreement, devoid of the crucial legally binding measures that would directly, contractually, hold global manufacturers responsible for factory conditions. USAS decries that agreement, known as the “Alliance for Bangladesh Worker Safety,” as a sham that “does not legally commit VF to ensure that a single unsafe factory is fixed.” Activists argue that the Bangladesh Accord, by contrast, would establish a binding commitment to uphold basic health and safety protections, and cooperate with workers’ advocates and unions on oversight. Although the global auditing sector has come under fire for being in bed with multinationals, the Accord attempts to build on basic independent auditing standards that were established through earlier waves of anti-sweatshop campaigning and have now become in many cases toothless. Currently, more than 150 brands have signed on, and independent investigators have already conducted an initial round of factory inspections. USAS has catalogued VF’s shameful labor track record: its Bangladesh supplier factories were hit with major fires in 2010 and 2012, and the company has been linked to rampant labor abuses in various countries, from widespread wage theft in the garment sectors of Honduras and Haiti, to suppression of labor organizing in Cambodia. As activists press the industry to redress the brutal injustices of one of the world’s most exploitative industries, attempts by brands like VF to preempt the Accord with more corporate-friendly run-arounds undermines the slowly building critical mass toward greater corporate accountability—though the Accord is a tiny start toward a comprehensive labor regulatory regime. 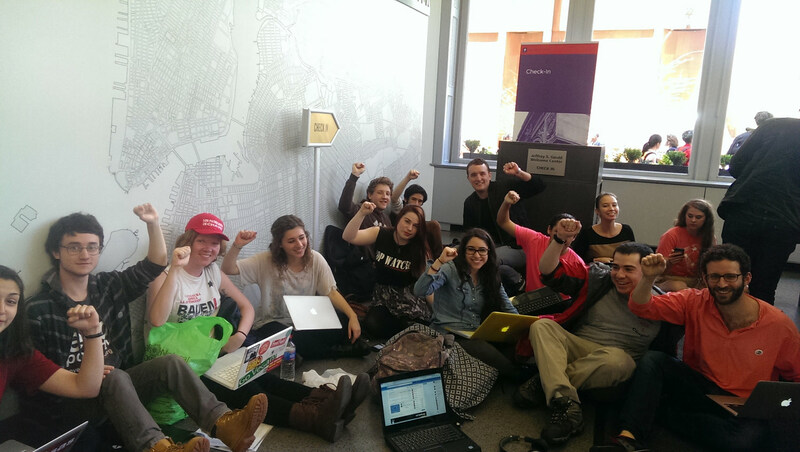 Now there’s a little more room on NYU’s campus to take those students’ pleas seriously. Campus campaigns for ethical commerce and investment often draw skeptical criticism for being mere window dressing on a corporatized academic power structure. But ongoing student mobilizations—against sweatshops, for divestment from fossil fuels, for cutting ties with regimes that violate human rights and ending the Israeli Occupation—have shown that activism taking place within the university hierarchy broaches critical issues of economic injustice. Carrying on a legacy of student movements, at one of the country’s most culturally insular and elite institutions, they’re making sure the dialogue on the brutality of labor and global capital reaches off campus to affect the wider world, and doesn’t just remain purely academic.